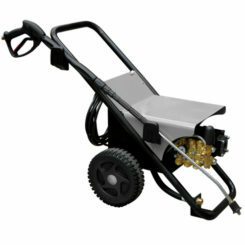 The CTM PWC 1211 is our heavy duty single phase industrial cold water pressure washer. 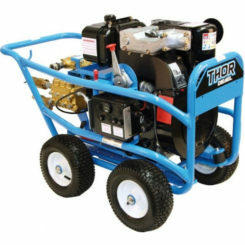 This machine is ideal for industries such as; car dealerships, transport, agricultural, food factories. 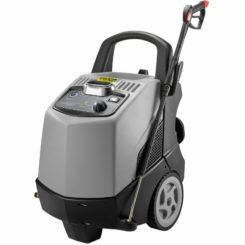 The CTM PWC is a powerful cold water pressure washer being able to provide 125 bar with a delivery rate of 660 l/h – GPM. 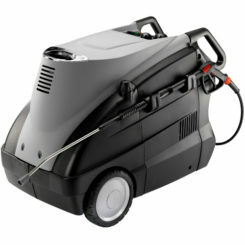 This machine is very high quality and is easy to use providing a very professional clean. Suction and delivery S/S valves. Integrated detergent suction with the external suction probe. Pressure Regulator. Glycerin pressure gauge. Hose-reel (optional). Accessory holder. Power cable holder. Steel frame. Steel cover. Click here to download PWC 1211 – Information page.